It is not without some hesitation that the writer ventures upon this theme. For he is mindful of the truth there is in that well-known saying about comparisons. Nor would he essay any comparison of the Kings River Canyon and the Yosemite Valley as two masterpieces of nature’s handiwork. That is a task for a more gifted pen than his. Besides, there is no need for it has been done, and well done, by acknowledged masters. What he proposes to give in these pages is a comparison of the outstanding features and characteristics of the two chasms as a geologist understands them. Perhaps it should be added, as a geologist of the present day understands them, for we have now at our disposal a wholly new branch of earth science, a branch that has developed almost entirely since the eighties of the last century —geomorphology, the science of the evolution of mountains and valleys and the surface features of the earth in general. Its application to the Sierra Nevada already has yielded a veritable harvest of new knowledge; it has given us an insight such as was impossible heretofore of that range—not only during the Ice Age and since its close, but also during the long stretches of time that went before. The Yosemite Valley has been studied in particularly close detail, and as a result we can now trace its evolution back through successive stages all the way to its beginning in a remote geologic period. The Kings River Canyon, it is true, has been accorded thus far little more than a reconnaissance, yet the salient facts of its history now also stand revealed, the key to them being furnished by the research that has been done in the Yosemite region and in other parts of the Sierra Nevada. What is to follow here, then, is an interpretation of the resemblances and differences between the two chasms in the light of this new knowledge. First, let us see what the main points of resemblance and difference are. As is generally agreed by those familiar with both chasms, the Yosemite Valley and the Kings River Canyon1 are most closely similar in their larger modeling, less so in their detail sculpture, and least in their environmental setting. Both are hewn like gigantic troughs, steep-sided, level-floored, and remarkably constant in width throughout, although more or less sinuous in course. In cross-sections they are broadly U-shaped, in contrast to the other great canyons of the lower Sierra, which are prevailingly V-shaped. They are even more broadly U-shaped than the typical glacier troughs of the High Sierra, which are among the most perfectly modeled of their kind. which they afford, largely make these yosemites what they are to us and what no narrow-bottomed gorge, however profound, can be. Both the Yosemite Valley and Kings River Canyon, be it observed further, are limited in extent strictly by their floors. 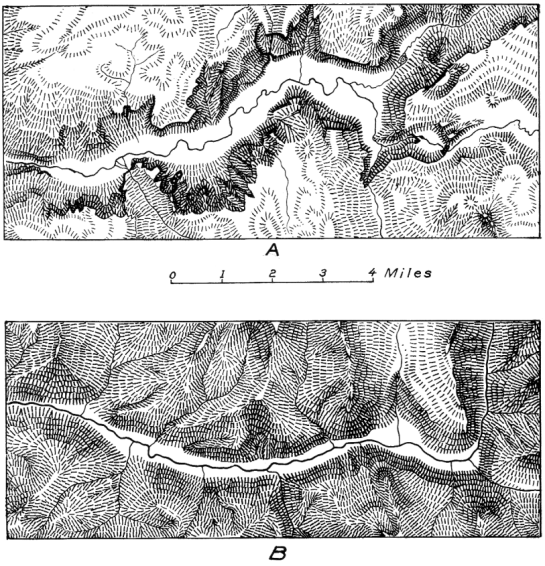 At the lower end each narrows down to an essentially V-shaped canyon, no wider at the bottom than the channel of the river (Fig. 3). And at the head each branches abruptly into two lesser canyons—or, to put it differently, each chasm commences abruptly on a grand scale of its own, the branch canyons opening into it by separate portals and at different levels. And so the Yosemite and the Kings River canyons both have the appearance of being complete in themselves, set off from the canyons above and below, although in reality they are but short links in extensive canyon systems. average three-fourths of a mile wide from cliff base to cliff base, and two miles wide from brink to brink; and it has a depth of 3000 to 3500 feet from brink to floor. The Kings River Canyon, on the other hand, is nine miles long, on an average only about three-eighths of a mile wide from cliff base to cliff base, and but slightly over one mile wide from brink to brink, in so far as it can be said to have any brinks. Its depth below the same ill-defined brinks ranges from 2000 to 2500 feet. The Kings River Canyon, therefore, though two miles longer than the Yosemite, is only one-half as wide and two-thirds as deep. 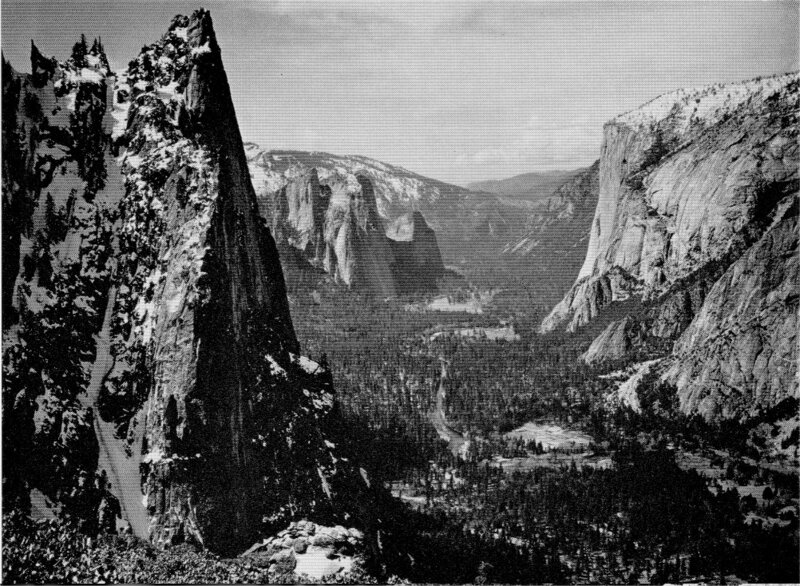 The cliffs in both chasms are distinguished in general by the same massive, monumental style of sculpture; but a comparison of individual rock-forms must naturally result in favor of the Yosemite. Nor is this because of any real deficiency in such forms in the Kings River Canyon, but rather because of the matchless wealth and variety with which the Yosemite is endowed. No other chasm on this continent, nor perhaps on any continent, possesses within so small a compass so remarkable an assemblage of uniquely sculptured cliffs and monuments. The upper part of the Kings River Canyon, however, is no distant rival; its Grand Sentinel and North Dome, though not quite so clean-cut as comparable forms in the Yosemite, are fully as majestic and impressive; and the Sphinx, were it situated in the tourist-thronged and well-advertised Yosemite region, no doubt would have long since become known the world over as one of its striking landmarks. But the lower part of the canyon possesses few sculptures of equal distinction. Some of its cliffs are of noble proportions, but they are not of the kind that stand out in the memory forever. In another respect also, it must be admitted, the Kings River Canyon cannot compete with the Yosemite—namely, in wealth of waterfalls. It possesses really but one cataract of note, that of Roaring River; and that cataract is to be measured only in tens of feet, whereas the falls in the Yosemite Valley are measured in hundreds of feet. This lack of falling waters in the Kings River Canyon is of peculiar interest, in that it is due in large part to the scarcity of typical “hanging valleys”—that is, tributary valleys opening abruptly at a considerable height above the floor of the main chasm. In the Yosemite region “hanging valleys” notably abound. Typical examples are the valley of Yosemite Creek, which opens at a height of 2565 feet; the valley of Ribbon Creek, which opens at a height of over 3000 feet; and the valley of Illilouette Creek, which opens at a height of about 1800 feet. From their mouths leap the glorious waterfalls for which the Yosemite is famed. The streams tributary to the Kings River Canyon, on the contrary, have nearly all cut their valleys down to so great depth that they debouch at or but slightly above the level of its floor. (B), permitting a direct comparison of their main features (same scale). 1400 feet; the valley of Copper Creek, at a height of 2000 feet; and the valley of Granite Creek, at a height of at least 1200 feet. But their streams, instead of leaping down in spectacular falls, descend in broken cascades ensconced in narrow slot-like gorges. The prevailing depth of the Kings River’s tributary valleys, again, is intimately linked with the extreme ruggedness of its flanking heights. These contrast with those of the Yosemite Valley as mountain peaks contrast with foothills. The Yosemite lies between unimpressive, billowy uplands, the individual swells on which are only 1000 to 1.500 feet high—only one-third to one-half as high as the chasm itself is deep. The Yosemite is therefore easily the dominant feature of its district; there is little in its environment to distract the eye from it. The Kings River Canyon, on the other hand, is surrounded by a galaxy of peaks and crests many of which tower 4000 and even 5000 feet above its brinks—to twice the height of the chasm’s own walls. To one who surveys the landscape from Lookout Point the disproportion is at once apparent, and yet, mirabile dictu, the chasm does not seem dwarfed, it loses not one jot in majesty, but rather gains by reason of its stupendous setting. And does not therein lie the real test of its inherent scenic grandeur? A chasm less sublime would sink into insignificance amid such titanic surroundings. And now let us see how these various facts are to be explained. Through what circumstances is it that the Kings River Canyon and the Yosemite Valley have come to be so closely alike in some respects, though so unlike in others? To begin with the most obvious: Both chasms unquestionably owe their broad trough form to repeated and intense glaciation. Their almost uniform U-shape and their sheer, spurless, parallel sides are characteristic features of glacier channels. But this does not necessarily imply that the chasms are products of glacier action alone or even mainly; it is clear from the positions of the moraines, as well as from many other things, that the chasms are stream-worn canyons that have been remodeled and enlarged by the ice, the transformation from the original V-shape to the final U-shape having been brought about by widening fully as much as by deepening. Just what proportion of the total work of excavation in either chasm is to be attributed to glacier action and what proportion to preglacial stream action has long been a moot question, but today we are for the first time in a position to give the answer, for the Yosemite at least, in rather definite quantitative terms. For it has been found possible to determine the preglacial depth of that chasm within narrow limits, and consequently it is also possible now to compute the amount of rock that was excavated by stream and glacier respectively. Indeed, the Yosemite is probably the first glaciated canyon whose preglacial dimensions and configuration have been ascertained in some detail.2 Three favoring circumstances have rendered this possible: the presence of certain features in the Yosemite Valley that are fairly reliable indices of its preglacial depth; the availability of a topographic base of adequate accuracy for necessary measurements of height and distance (the map which the writer prepared in 1905–06); and the granting by the U. S. Geological Survey of sufficient time and funds for an intensive study of the problem. For the Kings River Canyon no such definite figures can be given; indeed, it is doubtful whether any can ever be determined. But from the preliminary studies it seems reasonably certain that the depth of glacial cutting in the canyon was less, on the whole, than in the Yosemite, save at the extreme head, where it was about the same in both. A word, next, about the broad, level floors that distinguish the Yosemite Valley and the Kings River Canyon from the typical U-troughs of the High Sierra. These floors are not products of glacial excavating, but due in each case to a filling of loose debris that conceals the bottom contours of the U-trough. In the Yosemite the rock floor was scooped out by the ice in the form of an elongated basin—the basin of ancient Lake Yosemite—and this basin was filled with sand and gravel deposited by the Merced River. In the Kings River Canyon probably no basin was excavated (there may possibly have been a shallow one near the upper end), but during the final recession of the glacier the floor was left deeply encumbered with ice-borne debris. The Kings River Glacier evidently was much more heavily loaded with rock-waste than the Yosemite Glacier, and not only left one moraine loop after another, but between moraines liberated immense quantities of gravel and boulders that were spread out in thick sheets by the torrents flowing from the melting ice. This outwash material now forms the greater part of the floor upon which one travels and camps; only the crests of the recessional moraines emerge here and there above it. The difference in the nature of the filling in the two chasms accounts for the contrast in degree of flatness of their respective floors. The floor of the Yosemite is so nearly level that the eye can not detect its slope—it descends only twenty feet in a distance of five miles; whereas the floor of the Kings River Canyon descends 600 feet in a distance of nine miles, or at an average of sixty-six feet to the mile. The great width of both chasms is due largely to the fact that the glaciers were able to “quarry” laterally to far better advantage in them than in the canyons above or below. This glacial quarrying was facilitated by the prevalence of “joints” in the rock—more or less regularly spaced fractures—whereby blocks of convenient size were made available for plucking and transportation. The canyons above and below, on the contrary, are narrow, because the rock in them was less generally fractured—in fact, for considerable distances it was wholly undivided—and as a consequence the glaciers could only grind and polish. And in the hard Sierra granites these abrasive processes work with exceeding slowness. Another circumstance that doubtless contributed toward the production of the great width of the two chasms was the confluence at their heads of two powerful tributary glaciers. For it can be shown analytically that the consolidation of two or more glaciers into one is bound to result in a decided increase in economy of movement and a corresponding increase in kinetic energy (energy of mass movement due to gravitation) available for erosive action. But the importance of this factor should not be overrated, for there is ample evidence that a confluence of glaciers was not indispensable in every case in the Sierra Nevada for the production of a typical Yosemite. Instances are not wanting of such valleys whose heads are not marked by any junction of tributary glacier troughs. The Little Yosemite is a good example. In its case, certainly, the predominance of well-jointed and readily quarried rock is the prime factor that determined its great width. Withal there are few places in the Sierra Nevada where the relative impotence of the ice when dealing with massive, undivided granite is more strikingly exemplified than in some parts of the Little Yosemite. Liberty Cap and Mount Broderick, the two great bosses that obstruct its mouth, stood directly in the path of the glacier, yet they have survived as gigantic roches moutonneés, each being essentially an unquarriable monolith. There is, then, little doubt that both the Kings River Canyon and the Yosemite Valley have been developed in places where the joints in the rock permitted glacial quarrying on an extraordinary scale. Their broad trough form, accordingly, is a “function,” as mathematicians would say, of their rock structure. Of course, it is a function also of the quarrying power of the glacier. That the Kings River Canyon is only one-half as wide and two-thirds as deep as the Yosemite is due in part to the inferior quarrying power of the Kings River Glacier and only in part to the less quarriable nature of its rocks. Space does not permit here for the giving of a comparison of the Kings River and Yosemite glaciers. Suffice it to say that their relative magnitudes and quarrying powers are readily inferred from their respective moraine systems, of which the writer was able to make a comparative study in the summer of 1925. The detail sculpture of the cliffs of both chasms also is intimately associated with the varying structure of the rock. Indeed, each type of sculpture is the expression of a definite type of structure, and because of the delicacy of touch of the postglacial sculpturing agents—frost, temperature changes, running water, snow-slides, ground water, and so forth—every local change and vagary in the structure has been brought out in bas-relief. The massive, undivided granite in general gives rise to rounded domes and curving walls—it tends to assume simple flowing outlines, because it “exfoliates” at the surface in smoothly curving concentric shells. The jointed rocks, on the other hand, are carved into prevailingly angular, faceted forms. And where these two types of structure intermingle in capricious fashion, there arise forms of unusual, striking individuality, monuments of unique design, such as Half Dome, Cathedral Rocks, the Grand Sentinel, and the Sphinx. Two things account for the phenomenal array of bold and contrasting sculptural forms in the Yosemite Valley: the rather fortuitous assemblage within its compass of a number of differing types of rock, and the frequent occurrence of extreme types of structure in immediate juxtaposition. The upper Kings River Canyon owes its pronounced Yosemite-like sculpture likewise to the presence of granite of highly irregular structure; the lower part of the canyon, on the contrary, is cut in more evenly jointed rocks, and therefore is scenically less impressive. What now may be the reason for the marked disparity between the two chasms in the matter of hanging valleys and waterfalls? In the last analysis it, too, is traceable to structural influences. The elevated hanging valleys of the Yosemite region are held up by massive granite exceedingly resistant to both stream and glacier erosion. One need but view the grand cliff under the upper Yosemite Falls to be convinced of this fact: most of its rock is wholly undivided to a height of a thousand feet, and what few master joints traverse the western portion are spaced hundreds of feet apart. On the other hand, the deeply cut side gorges of the Kings River Canyon, and the little gulches incised into the lips of its few hanging valleys, all traverse rocks sufficiently fractured to give the eroding agents a good hold. But that, after all, is only a small part of the story. The significance of the hanging valleys themselves must be taken into account. They are the telltale features of the landscape that give us the key to the mysteries of the early history and the ultimate origin of the two chasms. 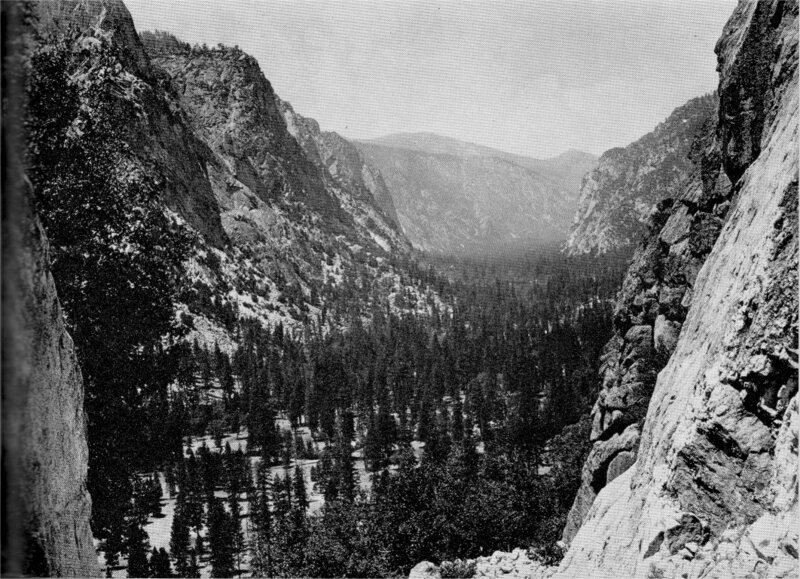 It has been commonly supposed that the hanging valleys whose waters pour into the Yosemite chasm are, like most hanging valleys in glaciated mountain regions, products of glaciation mainly; or, to state it more accurately, that they have remained suspended high above the chasm’s floor largely because the feeble branch glaciers that occupied them were unable to excavate as effectively as the powerful Yosemite Glacier. Undeniably great disparity in eroding power between the main glacier and its tributaries was a potent factor in developing and accentuating the discordance between the main chasm and its side valleys, but one would greatly err in giving it sole credit for producing the entire discordance in every case. As far back as 1913, when the farthest limits reached by the Yosemite Glacier were for the first time definitely mapped by the writer, it became evident that hanging valleys occur not only within the glaciated area of the Yosemite region, but also outside of it. A number of them actually occur on both sides of the lower Merced Canyon, many miles below El Portal, in whose vicinity the glacier terminated. A similar state of things has since been found in the unglaciated lower portions of Tuolumne, Stanislaus, and San Joaquin canyons. The ancient glaciers did not reach within thirty miles of the base of the range, yet typical hanging valleys, with cascades tumbling from their mouths, occur within a very few miles of the foothills. How are these facts to be accounted for? Were the side streams, perhaps, unable to trench as rapidly as the master streams? And if so, why? The Sierra Nevada, it is to be borne in mind, consists of a huge block of the earth’s crust that lies strongly tilted, with its eastern edge raised to a great height above its western edge. Whenever the slope of a block range of this kind is sharply accentuated by renewed earth stresses, the streams that run down its back, finding their paths appreciably steepened, will flow with greatly increased velocity and correspondingly increased eroding power. As a consequence they will rapidly deepen their beds and in the course of time entrench themselves in narrow gorges. But with this rapid trenching their feebler tributaries will be unable to keep step, and this is true especially of those tributaries which flow at right angles to the direction of the tilting, for they remain unsteepened and unaccelerated. Inevitably, therefore, the valleys of these tributaries will be left suspended high above the main canyon—they will come to be “hanging” valleys, simply as a result of the uplift of the range and without the intervention of glacial processes. Precisely this is what has happened in the Sierra Nevada. The Merced, flowing, as it does, directly down the western slope, as a result of the last strong tilting movement has been accelerated to torrential speed and ever since has been actively intrenching itself in a narrow gorge. But only its larger tributaries have been able to keep up with this trenching, the lesser ones, and especially those arranged at right angles to the direction of the tilting, having remained suspended high above the main canyon. reached. The dotted lines show the approximate form of the chasm at each stage. There are in the Yosemite region three distinct sets of hanging valleys, disposed at different levels one above another. The valleys of Ribbon Creek, Yosemite Creek, and upper Bridalveil Creek belong to the upper set; the valleys of Illilouette Creek and Indian Creek belong to the middle set; the gulches of lower Bridalveil Creek and Cascade Creek belong to the lower set. The A points of each set, moreover, are remarkably accordant among themselves and establish unmistakably a former profile of the master stream. There are thus three such profiles, each indicating a definite stage in the cutting of the chasm. Now the middle profile accords closely with the profile established by the hanging valleys in the lower Merced Canyon. It follows that the valleys of Illilouette Creek and Indian Creek owe their hanging character in the first instance to rapid gorge-cutting by the Merced in consequence of the last Sierra uplift. These valleys were hanging before glaciation set in, but their height has since been greatly increased by the glacial deepening and widening of the main chasm. It follows, further, that the upper set of hanging valleys is also of preglacial origin—that is, it became suspended as a result of rapid gorge-cutting induced by an earlier uplift. Only the lower set of valleys, or gulches, owes its height above the floor of the chasm to glaciation. The story told by the hanging valleys of the Yosemite region, then, is a story of two long chapters of gorge-cutting by the Merced due to two great uplifts of the Sierra Nevada, followed by a chapter of glaciation. The depth of the Yosemite at each stage being known, it is not difficult to draw its approximate cross-section for each stage (Fig. 4), and to determine its relations to the surrounding country. In this way it has been ascertained that the chasm began its existence as a broad, flat valley only a few hundred feet deep, flanked by a lowland covered with rolling hills. The present billows on the uplands are these same hills lifted to a higher level. In the second stage the Yosemite had the depth and aspect of a mountain valley. It was cut about 1000 feet below the rolling country on either side and already had hanging side valleys from whose mouths the waters descended in broken cascades. In the third stage the Yosemite had the appearance of a rugged canyon with a narrow inner gorge, its total depth averaging about 2500 feet. It had two sets of hanging valleys, a high and a low one, and its sides consequently were adorned by many glorious cascades. Finally the canyon was profoundly remodeled—deepened and widened —by the glaciers of the Ice Age, and its cascades were transformed to leaping waterfalls. There being no fossil-bearing deposits in the Yosemite region, the writer at first was at a loss to find a way to determine the geologic age of any of its pre-glacial stages. In 1921, however, he succeeded in carrying his work northward to the nearest locality where fossils are known to occur. This locality was none other than Table Mountain—the Table Mountain where resided Bret Harte’s Truthful James! And there the writer was fortunate enough to be guided to the right spot by that veteran miner and lover of the earth sciences, Mr. J. B. Pownall, of Stockton and Sonora, and excellent casts of leaves from the hardened silts of a “fossil stream channel” were secured. Through the courtesy of Dr. John C. Merriam, again, the casts were submitted for identification to Dr. Ralph W. Chaney, Research Associate of the Carnegie Institution; and by him they were pronounced to be in all probability of late Miocene age.4 And thus it has been established, as definitely as is possible with the scanty palaeontologic material at hand, that the earliest recognizable stage of the Yosemite Valley—that indicated by the upper set of hanging valleys—antedated the close of the Miocene epoch. The first great uplift, it may be presumed, therefore, took place about the dawn of the Pliocene epoch, and it was during that epoch that the first set of hanging valleys was produced. The second uplift took place probably about the close of the Pliocene, and consequently, by the beginning of the Pleistocene epoch (which included the Ice Age), the second set of valleys was suspended. In the present landscape of the Yosemite region, then, the billowy uplands and their associated hanging valleys represent remnants of the ancient landscape of late Miocene time, preserved by reason of the exceedingly resistant nature of the massive granite. The valleys of Illilouette Creek and Indian Creek, which lie at a considerably lower level, are remnants of the Pliocene landscape, somewhat modified by glaciation; and the gulch of Bridalveil Creek is a prominent feature of the early Pleistocene canyon stage of the Yosemite that has escaped destruction by the ice. In the Kings River region, owing to the poor preservation of the hanging valleys, and also because of the lack of an accurate large-scale map, the successive stages in the development of the main chasm are much more difficult to determine. Nor is it easy to single out remnants of the Miocene and Pliocene landscapes on the flanking mountain massifs. Indeed, but for the guidance afforded by the analyses made in the Yosemite region and in other parts of the Sierra Nevada, probably little headway would be possible in the spelling out of the story of the development of the Kings River Canyon. As it is, however, much can be accomplished in spite of the existing handicaps. landscape, more or less glaciated, may be identified on the crest of the Monarch Divide. Of these, Granite Basin, indeed all of the elevated upper valley of Granite Creek, is of peculiar interest; for its longitudinal profile, extended forward to the axis of the main chasm (Fig. 5), would seem to indicate the approximate level of the master stream for that early epoch. The South Fork, it will be seen, then lay in a wide-flaring valley 3600 feet shallower than the present chasm, yet already carved 3000 feet below the summits of the Monarch Divide. Again, there is reason to believe that the longitudinal profile of Cloud Canyon (not shown in Fig. 5), duly corrected for glaciation, indicates the level to which the main chasm was cut during Pliocene time. Sugarloaf Valley probably also belongs to the ancient landscape of that epoch. Finally, it is not impossible that the lower valley of Granite Creek affords some indication of the depth of cutting achieved by the South Fork immediately prior to the coming of the glaciers. Thus, tentatively and by degrees, one may find the way into an analysis of the features of the Kings River region. Possibly someday when that region shall be included in a great national park, as it well deserves to be, a more detailed map of it will become available, and the foundation will be laid for an intensive and quantitative study such as has been made of the Yosemite Valley. What a wonderful thesis for a future student of geomorphology that would be! Reprinted from Sierra Club Bulletin, 1926, pages 224-236. 2In sufficient detail to permit the drawing of a contour map from which a relief model of the preglacial Yosemite chasm can be constructed. 3See footnote on page 62.—Ed. 4See Appendix for table showing Major Divisions of Geologic Time in use by the U. S. Geological Survey, and the time values for these divisions as determined by the Committee on the Measurement of Geologic Time, National Research Council.—Ed.